Effective delivery of small and large bio-molecules into cells for therapeutic purposes is challenging, owing to the fact that lots of these molecules cannot freely penetrate through the cell membrane. Large bio-molecules delivery such as proteins is further exacerbated by their inability to escape cellular endosomes. In the Rotello Research Group, we use functionalized gold nanoparticles (AuNPs) and nanoparticles-stabilized capsules (NPSCs) to deliver small molecule drugs as well as bio-molecules such as CRISPR, siRNA, genes and proteins, alone or in combination, into mammalian cells. Research is also on progress to deliver such molecules into animals to treat certain diseases. We are also working on bioorthogonal catalysis using transition metals in nanozymes. Bioorthogonal catalysis using transition metal catalysts (TMCs) is a promising strategy that enables scientist to do artificial transformations in the same physical space that biological processes take place continuously, yet does not interfere with already existing cell machinery. However, issues such as lack of biocompatibility, water solubility, catalyst stability and rapid efflux of catalysts from living cells make it challenging to employ TMC-mediated bioorthogonal catalysis. We developed a gold nanoparticle (AuNPs) based platform where hydrophobic TMCs are been encapsulated into the hydrophobic pocket of the AuNP monolayer to build the “active site” of an artificial enzyme called “nanozyme”. The activity of nanozyme can be reversibly controlled by binding a supramolecular cucurbituril ‘gate-keeper’ onto the monolayer surface, providing a biomimetic control mechanism that mimics the allosteric regulation of enzymes. 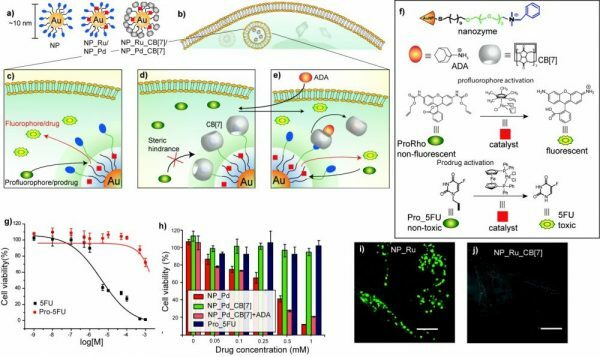 The potential of this gated system has been demonstrated by the activation of profluorophores and prodrugs in living cells for imaging and therapeutic applications. .
a) Nanozymes. b) Endosomal uptake of nanozymes. c) Intracellular catalysis with NP_Ru or NP_Pd. d) CB complexation inhibits catalyst activity in NP_Ru_CB. e) Nanozyme activity is restored by competitive guest ADA. f) Structures of components used in study. g) Cell viability of 5-FU versus pro-5FU. h) Intracellular prodrug activation using gated catalysis. i,j) Supramolecularly regulated intracellular chemical generation of fluorophore in HeLa cells (scale bars = 10 μm). Tonga, G. Y.; Jeong, Y.; Duncan, B.; Mizuhara, T.; Mout, R.; Das, R.; Kim, S. T.; Yeh, Y-C.; Yan, B.; Hou, S.; and Rotello, V. M “Supramolecular regulation of bioorthogonal catalysis in cells using nanoparticle-embedded transition metal catalysts” Nat. Chem. 2015, 7, 597-603. Our laboratory developed two different cytosolic protein delivery platforms. First one is an engineered protein-nanoparticle nanoassembly system, and the second is a gold nanoparticle-stabilized nanocapsule (NPSC) system. Nanoassembly platform: While proteins of interest were engineered to carry a long glutamic acid tag (E-tag), gold nanoparticles were engineered to carry oppositely charged arginine groups. These engineered proteins and nanoparticles formed large self-assemblies that get fused to cell membrane and directly deliver protein content into cytosol. Using this strategy, we delivered a large number of proteins of different sizes and charges, including gene recombinase and therapeutic proteins, into cells. Moreover, this method allowed us to monitor the trafficking of proteins into destination organelle. NPSC platform: These NPSCs are formed and stabilized through supramolecular interactions between the nanoparticles, the protein cargo, and the fatty acid capsule interior. The effectiveness of these NPSCs as therapeutic protein carriers was demonstrated through the delivery of fully functional caspase-3 to HeLa cells with concomitant apoptosis. 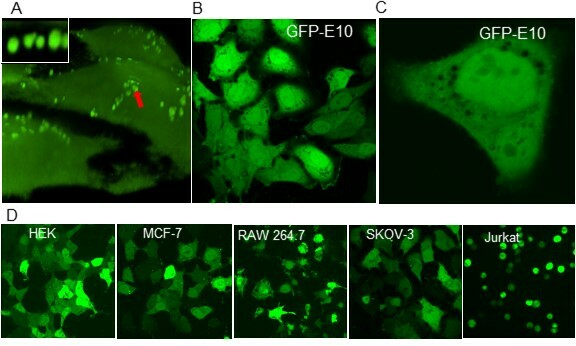 Analogous delivery of green ﬂuoresecent protein (GFP) confirmed cytosolic delivery. A) Cytosolic protein delivery using engineered nanoassemblies (green dots) through membrane fusion-like mechanism. B & C) GFP-E10 delivery. D) GFP-E10 delivery into different cell lines. 1) Tang, R.; Kim, C. S.; Solfiell, D. J.; Rana, S.; Mout, R.; Velázquez-Delgado, E. M.; Chompoosor, A.; Jeong, Y.; Yan, B.; Zhu, Z.-J. ; Kim, C.; Hardy, J. A.; Rotello, V. M. “Direct Delivery of Functional Proteins and Enzymes to the Cytosol Using Nanoparticle-stabilized Nanocapsules” ACS Nano 2013, 7, 6667-6673. 2) R Mout, GY Tonga, L Wang, M Ray, T Roy, Rotello, V. M. “Programmed Self-Assembly of Hierarchical Nanostructures through Protein-Nanoparticle Coengineering” ACS Nano 2017, 11 (4), 3456-3462. 3) R Mout, M Ray, T Tray, K Sasaki, GY Tonga, Rotello, V. M. “A General Strategy for Direct Cytoplasmic Protein Delivery via Protein-Nanoparticle Coengineering” ACS Nano 2017, 11 (6), 6416–6421. Genome editing through the delivery of CRISPR/Cas9-ribonulceoprotein (Cas9-RNP) reduces unwanted gene targeting and avoids integrational mutagenesis that can occur through gene delivery strategies. 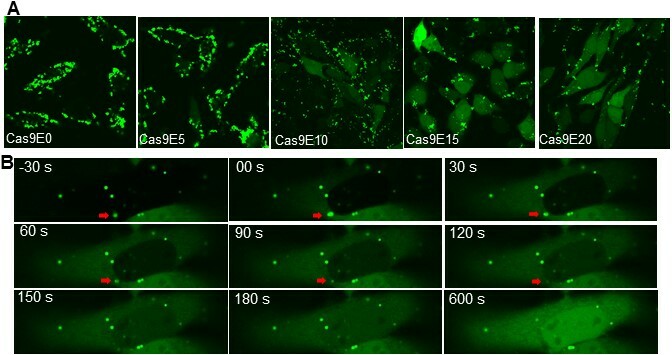 We achieved a remarkably high efficient (~90%) direct cytoplasmic/nuclear delivery of Cas9 protein complexed with a single guide RNA (sgRNA) through the co-engineering of Cas9 protein and carrier nanoparticles. In our approach, we engineered the Cas9 protein to carry a long glutamic acid tag (E-tagged Cas9 or Cas9En). Complementary gold nanoparticles self-assembled with Cas9En, fused with cell membrane, and directly delivered the Cas9En into the cytosol. This construct provided effective (~30%) gene editing efficiency and opens up new opportunities in studying genome dynamics. A) Cytoplasmic delivery of Cas9En increased with the length of E-tag. B) Real-time delivery of Cas9E20 into HeLa cells. Mout, R.; Ray, M.; Yesilbag Tonga, G.; Lee, Y.-W.; Tay, T.; Sasaki, K.; Rotello, V. M. “Direct Cytosolic Delivery of CRISPR/Cas9-Ribonucleoprotein for Efficient Gene Editing” ACS Nano 2017,11 (3), 2452-2458. In the past two decades, there has been significant academic interest in applying RNA interference (RNAi) as a novel approach for disease therapy. With RNAi, specifically through the delivery of short interfering RNA (siRNA), it is possible to knockdown the expression of disease-related proteins to reverse disease progression in a non-toxic and safe manner. However, current RNAi-based therapies are hampered by a lack of truly effective delivery vehicles for siRNA, minimizing the total efficacy of such treatments. In our group, we have developed a nanoparticle-stabilized capsule vehicle for the direct, cytosolic delivery of siRNA for disease therapy. Linoleic acid emulsions are coated with functionalized gold nanoparticles that electrostatically associated with siRNA. We have demonstrated the efficacy of this vehicle in delivering siRNA in vitro and in vivo, for direct cancer therapy as well as immunomodulation. Schematic presentation of NPSC-mediated co-delivery of both siSurv and tamoxifen for enhanced cancer therapy. 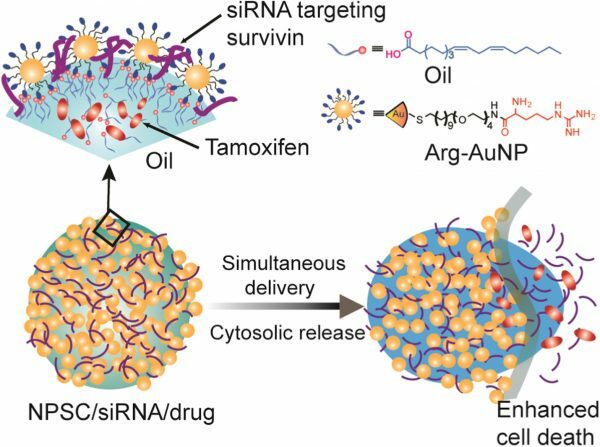 1) Jiang, Y.; Tang, R.; Duncan, B.; Jiang, Z.; Yan, B.; Mout, R.; Rotello, V. M. “Direct Cytosolic Delivery of siRNA Using Nanoparticle-Stabilized Nanocapsules” Angew. Chem. Int. Ed., 2015, 54, 506-510. 2) Hardie, J.; Jiang, Y.; Tetrault, E. R.; Ghazi, P. C.; Tonga, G. Y.; Farkas, M. E.; Rotello, V. M. “Simultaneous cytosolic delivery of a chemotherapeutic and siRNA using nanoparticle-stabilized nanocapsules” Nanotechnology., 2016, 27, 374001.